Their eyes met, yet no words were necessary. Not after 65 years of marriage, not after raising five children, not after helping one of their children successfully fight the disease of addiction and certainly not after successfully answering every challenge that could potentially derail a relationship. They already knew what the other was thinking, what was in their hearts. “I love this woman more every day; I’ve never loved her more than I do today,” Roy Kliebert said, emotion pouring through his every word, a glint of a tear trying to form in his 87-year-old eyes. Roy and Marie Kliebert, longtime parishioners at St. Joseph Church in Paulina, are one of several couples scheduled to be honored during the annual 25th, 50th, 65th and over Diocesan Wedding Anniversary Mass and celebration hosted by the Office of Marriage and Family Life of the Diocese of Baton Rouge on Feb. 10 at 2 p.m. at St. George Church in Baton Rouge. As is often the case, at least in an era before online dating sites dictated one’s social life, the Klieberts met through a mutual friend. 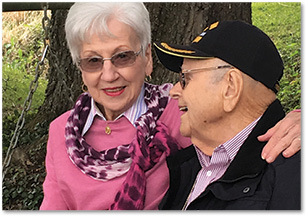 For Roy, the seeds of love were planted almost immediately and nurtured for the next year. So he turned to a friend, who said he “knew a girl” that might be interested. Little did anyone know the introduction would last a lifetime. “I felt the love, I felt the power of love,” Roy recalled with a smile, those memories seemingly as fresh as they were 66 years ago. By Christmas, Roy had given Marie a cedar chest, which in those times was tantamount to announcing one’s engagement. In April, Roy asked Marie’s father, a staunch Catholic who made annual retreats to Manresa Retreat House in nearby Convent, for his daughter’s hand in marriage. “He said fine but first I had to make a retreat to Manresa,” said Roy, who by his own admission, was not particularly religious as a young man. On Aug. 1, 1945, the couple was married, one year after dancing the night away on their first date. The couple would have five children – three sons and twin daughters – which Marie calls her “full house. Three kings and two queens.” Life was not always easy, especially as Roy commuted to New Orleans to manage rental property for his uncle’s real estate firm. And he would later open a drive-in restaurant that he would keep for 13 years before selling it to his daughter. Perhaps the most challenging time of their marriage came during the teen years of their children, which included a son struggling with drug addiction. Those lessons learned guided Marie and Roy to founding the first Al-Anon group in Lutcher and they remained active for several years assisting and even counseling other families facing similar circumstances. “Yes, it was tough times, but we drew closer and closer in our relationship,” Marie said, adding that in 1979 the couple began attending daily Mass at St. Joseph, a practice they continue today. “We needed to be together. Marie and Roy have been active at St. Joseph throughout their marriage. Roy has served a combined 40 years on the parish council and is still a member. Marie was the first woman to be elected as chairperson during her time on the council. They were also involved in other ministries, including Roy teaching high school religion classes at his home. He also started a Men in the Sacred Heart group at St. Joseph and is a Fourth Knight in the Knights of Columbus. During the past several years, Roy has endured several health setbacks, but even then their love has strengthened. While in the hospital, including a recent stay, Marie stayed by her husband’s side, not even leaving at night. So what is the secret to nurturing and maintaining a strong marriage, especially during difficulties most couples never endure? They both agree couples must present a unified front, especially involving parental issues. And no TV or phone calls were allowed during that family time. Most important, they agreed, is God has to be at the center of the family. “Without God, we would not have survived,” Roy said.